I have described Norwegian meat balls as serious comfort food for those of us that have moved away from home. Our mothers are serious competition to any cook that dare to put this staple food on the menu. At M3 in Oslo they have dared, and the result was not like my mothers meat balls, but still a delicious variation over a known theme. As our regular hangout Fire Brødre has closed its kitchen on Sundays my friend Ketil and I decided to check out a new place called M3, referring to the address Maridalsveien 3, one of the first numbers of one of Oslo's longest streets. I will most certainly return to write a review of this place. They have a small menu, a soup, smørbrød (open sandwiches), a few meat and a few fish dishes salad and desserts. They have one main course of each day of the week and this Sunday it was Meat balls, lucky us. The price tag is on a rather normal level in Oslo, meaning around €15 for dinner. It was very good, the meat balls were more like Swedish "Kjøttbullar" than Norwegian "Kjøttkaker" in size, but they were made from freshly ground meat, and we were informed that it was supplied by the butcher Strøm-Larsen, founded in 1903. 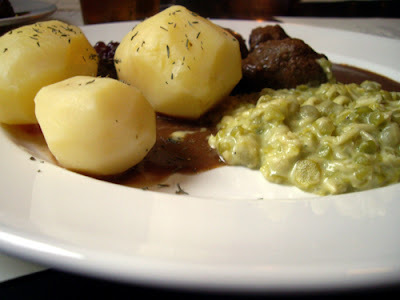 And the meatballs were served with boiled potatoes, a good and waxy variety, gravy, homemade lingonberry jam and mushy peas. Great stuff. So if you live in Oslo, try this new place, and as a tourist they serve Norwegian specialities with a new twist. And M3 has character, as it is in an old brewery with an air of the late 19th century.